Learn how to create a classroom for you and your students. Classrooms can be used to assign lists, track user progress, and even create new accounts for your program! You'll need to be logged into the Skritter Classroom in order to create your classroom. Click the New Classroom button. 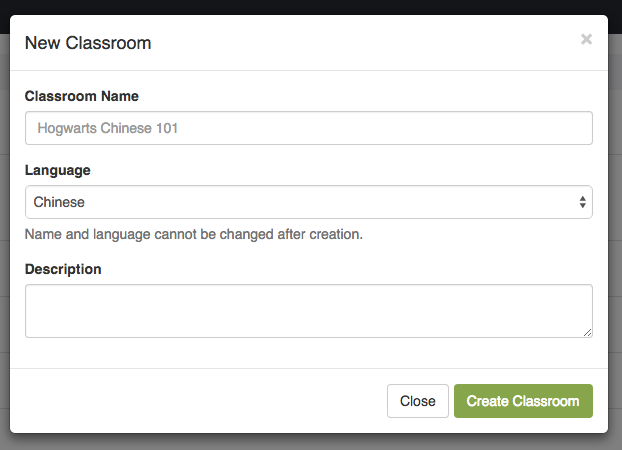 Enter your classroom name, select your language, and add a brief description. Click the Create Classroom button and it will appear on your Skritter Classroom main page. The classroom name and language cannot be changed once it has been created. If you want to make changes please delete the classroom and create a new one.